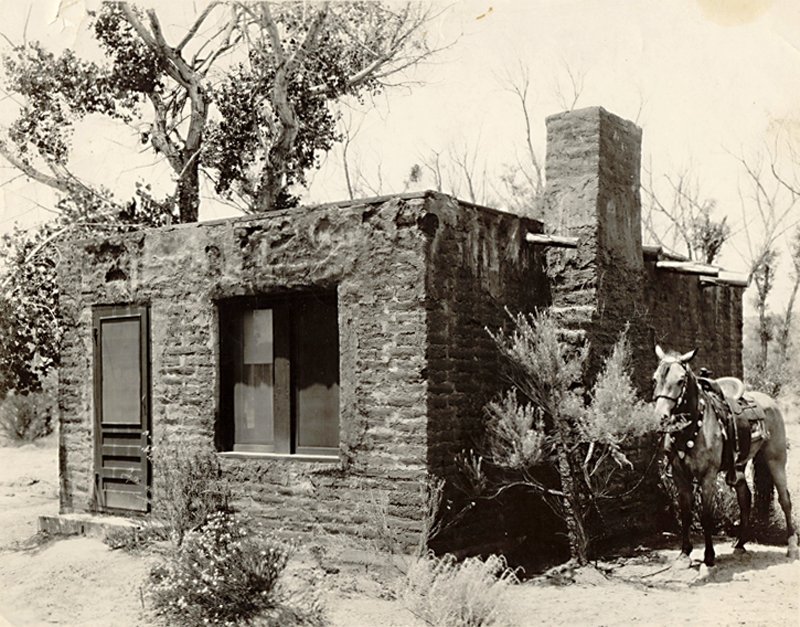 Harry Carey Sr. built this adobe cabin for the famous Western painter Charles M. Russell to stay in when he visited the ranch in Saugus, at the mouth of San Francisquito Canyon Road (just north of today's Copper Hill Drive). Date unknown. We have to assume the cabin washed away in the 1928 St. Francis Dam Disaster, but we don't know. Russell died in 1926. Other photographs show Russell at the ranch in 1923. Harry Carey Jr.'s caption on the back of this photo reads: "Guest Cottage at Ranch / Chas. M. Russell painted here." Will James and — Charlie Russell came; my father built a cabin, an adobe cabin, just below our house for him to stay in when he came up and visited. Q: Did Charlie Russell paint at the ranch? Yes, he painted a mural. My aunt Mignon, who was with us, she said that he painted on a mural down there in that cabin and he had it stretched on the floor. It's in that mission behind Ventura now. DC2201: 9600 dpi jpeg from original print courtesy of Harry Carey Jr.